At the beginning of this month I was invited to be a part of a "Movember movement". I'm pretty sure you all know what a term "Movember" stands for, but in case some of you don't know, it's is a month-long event involving the growing of moustaches during the month of November to raise awareness of prostate cancer and other male cancer and associated charities. So since there are a few very important men in my life, I am very happy to be a part of this event and to spread the word about it here on magnifique as well! And not to mention this adorable bracelet that I was sent by Golden Stella, that adds a little bit of a fashion vibe to the whole experience! Love your outfit. Your yellow sweater and your skirt are so pretty. perfect look, I adore all details! you look wonderful! love your skirt and sweater:)! Great look, very polished. 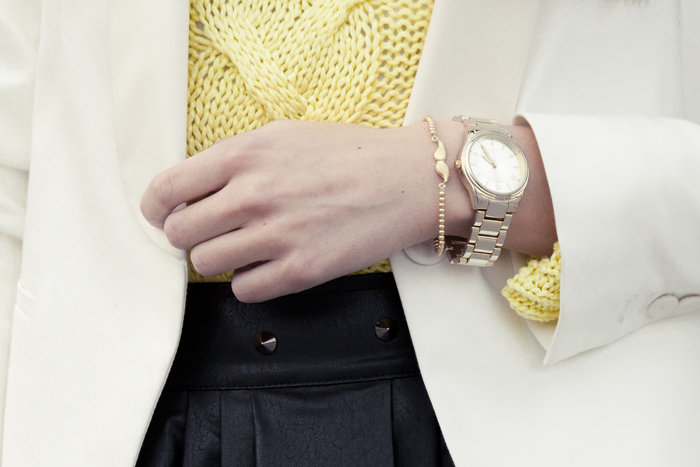 I love the addition of the yellow, that little pop of colour to a black/white ensemble, and in a knit so even better! Lovely oufit. I like the match black and yellow! Really nice. and great blog. Do you want follow each other? :) will be nice! Thanks for visiting my blog! Like your boots! Awesome bracelet! The acceptable movember for girls!!! I love this colour combination!! great look!! que bonito conjunto!! la falda me gusta mucho!! Tengo una parecida y la verdad es que ver looks con ella me da a mi muchas ideas. 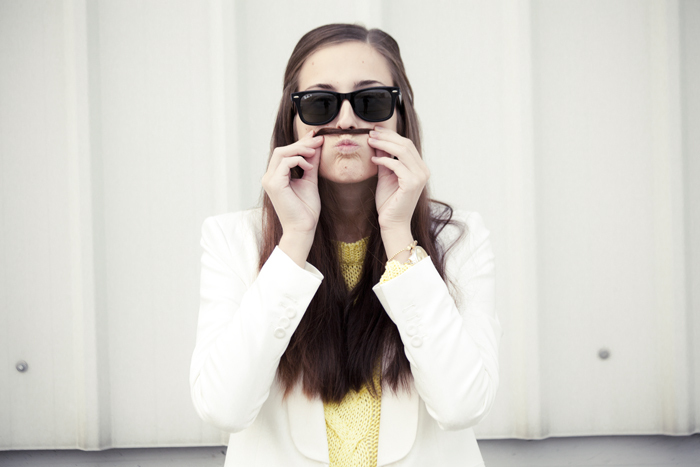 Love your style and your blog!! !amazing skirt!! lots of kisses! What about the ankle boots?!!! love them. the brand? The skirt is absolutely amazing! Love that you are a part of the cause! I am currently raising money for the American Cancer Society and am so glad so many people are willing to fight against cancers of all kinds! Your outfit is amazing, you look adorable! How cool ! Movember is such a nice thing to be part of ! And the look and bracelet are very cute ! PS: I loved your blog so I followed you at bloglovin, facebook and twitter ! I love the simplicity yet edginess of your outfit, you look wonderful! Oooohhh genial el look la falda es preciosa y el jersey chulísimo!!! your nice comment made me what to check your blog out and im glad i did !